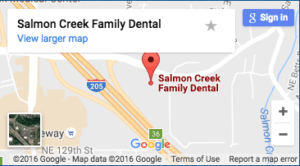 Here at Salmon Creek Family Dental, the dentist in Vancouver WA, we have patients who are expecting and ask us questions regarding oral health care. When a female becomes pregnant, she knows how important it is to maintain a healthy lifestyle; this will ensure the health of her and her baby. New clinical recommendations from the American Academy of Periodontology (AAP) and the European Federation of Periodontology (EFP) urge pregnant women to maintain periodontal health as well. This information has indicated that women who have periodontal disease are at higher risk of having adverse pregnancy outcomes, such giving birth to a pre-term or low-birth weight baby, reports the AAP and EFP. Periodontal disease is a chronic gum disease; it is a bacteria-induced, inflammatory condition that will attack the gum tissue. In severe cases it will attack the bone that supports the teeth. If gum disease is not treated, it can lead to tooth loss. Gum disease often goes undiagnosed. There are symptoms that people experience and often ignore, such as swollen gums, redness, and even bleeding gums. Gums that bleed when you use a toothbrush or eat are common signs. What happens is the gums will pull away from your teeth, and you can have chronic bad breath, and eventually loose your teeth. If you have these signs when you are pregnant, do not ignore them. Several research studies have suggested that women with periodontal disease may be more likely to deliver babies prematurely or with low-birth weight than mothers with healthy gums. According to the Center for Disease Control and Prevention (CDC), babies with a birth weight of less than 5.5 pounds may be at risk of long-term health problems such as delayed motor skills, social growth, or learning disabilities. If you are pregnant and think you are at risk for periodontal disease these tips can help. When your baby comes, it will be difficult to maintain structure and a solid routine. But practicing a good health regimen now will help ensure consistent habits. Brush and floss your teeth every day for the best benefits. Women who are pregnant who visit their dentist for a periodontal evaluation can often decrease the chance of adverse pregnancy complications. Dr. Nelson says it is important to monitor your periodontal health throughout each stage of your life. For a full evaluation visit us today #360-696-9461.